I have to tell you the Little Caesars down the street from work puts out a pretty good pizza for $5. 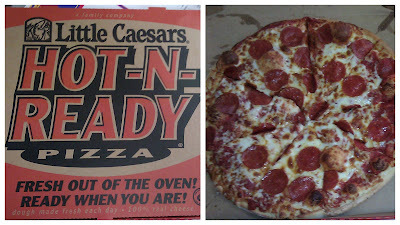 I've heard about less than desirable results with the Hot-N-Ready, but the only complaint I've ever had was that they didn't get the pizza cut all the way through in a couple of spots. 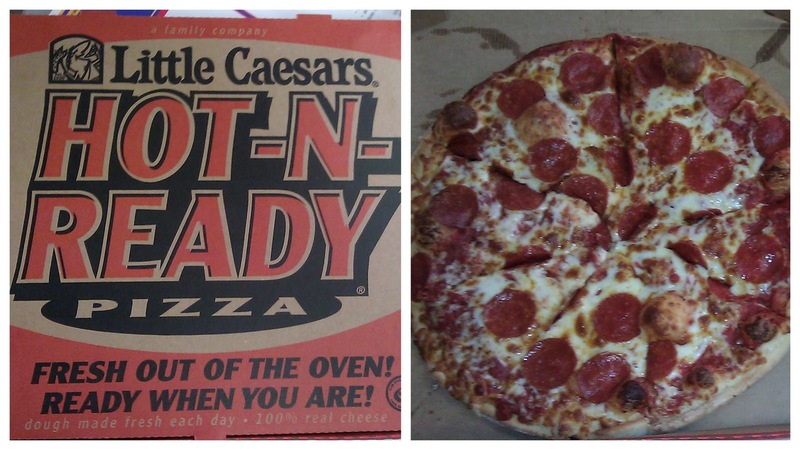 I'll take a Hot-N-Ready any day over a fast food burger joint. Plus for $5 I can have left overs for lunch the next day. Free Pizza at work, Just about the best kind. 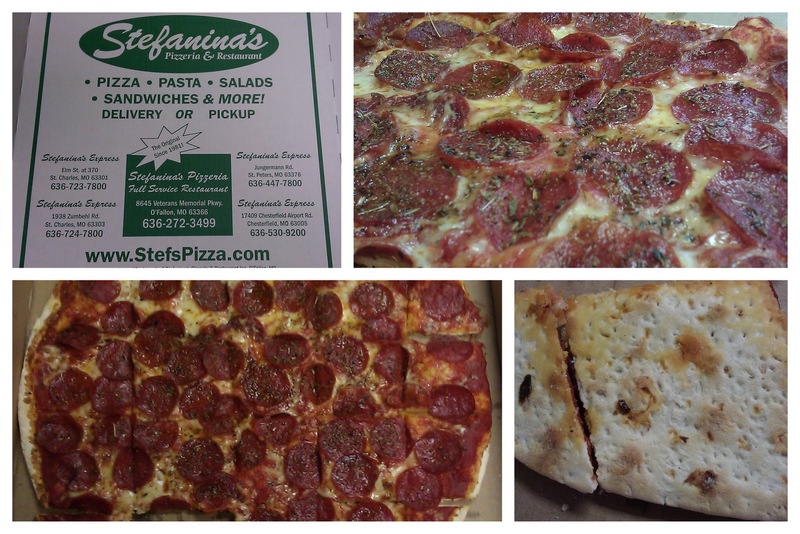 Stefanina's was the pizza of choice. We had Pepperoni with Mozzarella cheese. 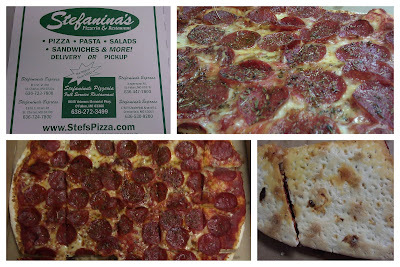 For a St Louis style pizza it was pretty good, I will defiantly be taking a more in-depth look at Stefanina's in the future. For now Recommended But, get Mozzarella cheese instead of Provel. The Skinny: Great Pizza, but save room for Dessert. Chief Pizza eater says: Highly Recommended. Late last year I posted a question in the Missouri section of CityProfile.com asking, whats your favorite pizza joint? I've got a whole slew of responses, one being Schlafly Bottleworks in Maplewood, MO. So last week when the Mrs. Pizza Eater asked if I wanted to go out for lunch, I said I have just the place. 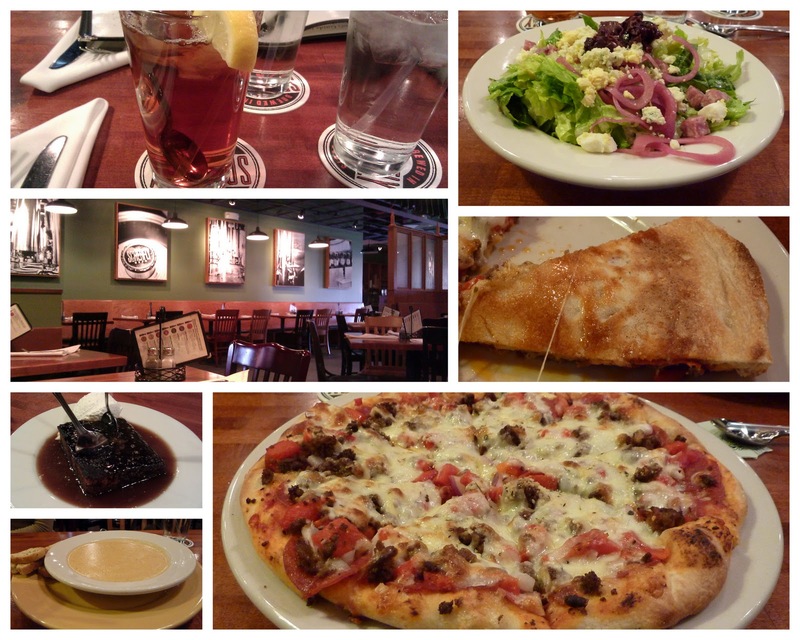 We arrived around 2 P.M. for a late lunch and we started with Ice tea and Chopped Salads. The salad has romaine lettuce with red wine vinaigrette, Salemville bleu cheese, Volpi salami, pickled red onions, hard-boiled egg and kalamata olives. The salad was excellent, I loved the pickled red onions. The Mrs. Pizza Eater choose to be a non-pizza eater and ordered the soup of the a Tomato Bisque. It was rather good too, but not pizza. For pizza Schlafly makes a Pilsner dough fresh daily, they are a brewer first and pizza joint second. Then you have a choice of sauces, cheese and toppings. Your choice of sauce includes a tomato sauce or a smoked Gouda cream and garlic oil. For cheese there is the House blend (Mozzarella, smoked Gouda, Provolone, Jack and Prairie Breeze), Mozzarella, Feta, goat or vegan mozzarella. The topping list isn't huge, but it is interesting. For example they don't have hamburger or beef, instead they have Bison. It should also be noted that all pizza's are about 10 inches, filling a dinner plate. For my pizza I ordered tomato sauce, House blend cheese, pepperoni, Bison, onions and roasted red peppers. The pizza was very good. The crust was fairly thick across the whole pie and cooked to give it a crispy crunch. The toppings were all very good to, but I couldn't tell a big difference in the Bison verses fresh ground beef. The House blend cheese probably has more Mozzarella than the other cheese's, at the table with the pizza still pretty hot the flavors melded together. As it cooled you could start to taste the different flavors. I ended up with a couple of slices left over and they passed the breakfast test with flying colors, nearly as good cold the next day. I took pizza home because I had to save room for dessert. The dessert menu is not large, but huge in quality. We ordered the Sticky Toffee Pudding. Straight from the menu: Pudding in the Scottish sense – a very moist, dense cake. Served with warm caramel sauce and freshly whipped cream. Let me just say this, You must save room for Dessert! I have never had whipped cream this good before, ever! Put it all to gather and it is Wicked good. Schlafly Bottleworks is most defiantly worth a visit. The service is great and if you are a beer connoisseur, they have you covered, you can even tour the brewery on certain days. They also work at being green from sourcing ingredients locally to the building they are located in (recycled supermarket that had just been sitting empty).